South Texas Wedding | Planning My South Texas Wedding one 'Two-Step' at a Time! Hi y’all! It’s been TOO long. I just wanted to let y’all know that Shutterfly is having a promotion for 24 free address labels right now (7/14 is the LAST day). Just use the code SUMMERLABEL and snag your free address labels. All they ask you to pay is shipping and taxes. These would be great to put on Thank You notes with your new Mr. and Mrs. title! This was the design that we chose. What design will you choose? 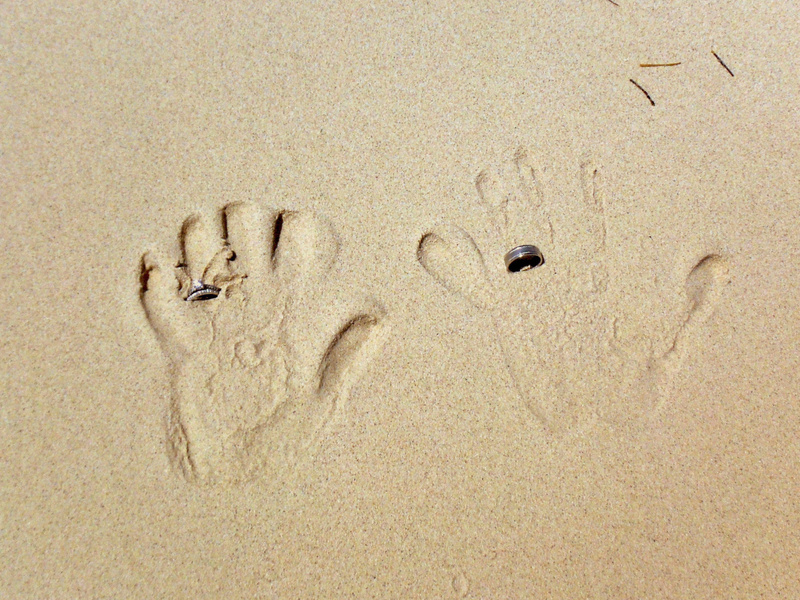 Pinterest inspired “Rings in Sand” picture from our Honeymoon in Jamaica. Of course, ours was taken with our waterproof camera at a bad angle with some sea trash on the top right hand corner, but its ours. You can also tell that my hand was a little more wet then his as seen in the smudges of my palm. Our plan, to take a “Rings in Sand” picture for EVERY beach that we visit. What better way than to start with our Honeymoon Beach!? Honestly, I didn’t mean to make bites…I wanted to make cookies, but our cookies sheets were dirty and I was too lazy to clean them. I didn’t plan on making any dessert today, but when I was shopping at HEB, the candies were on sale so I decided to buy and come up with something. As I walked through the store, the Pillsbury cookie dough was also on sale. You can see where this is going. 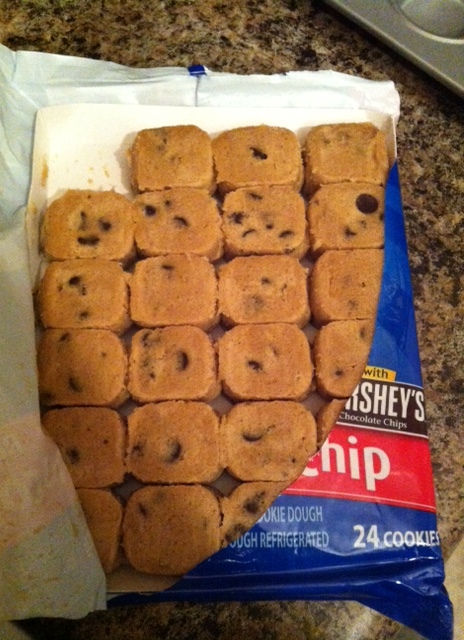 So, I bought some chocolate chip cookie dough. Well, I opened this one already, got a little too anxious. 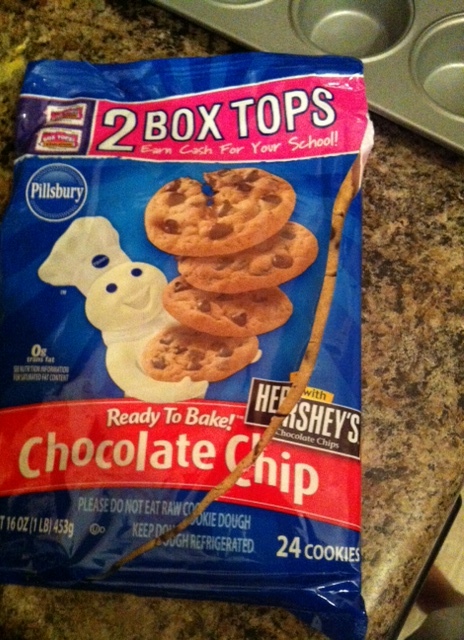 The Pillsbury cookie dough comes already portioned. I took each pre-portioned dough ball and rolled it around a Mini Rolo or a Mini Reeses Peanut Butter Cup. I did 12 mini-Rolo’s and 12 mini- Reese’s. 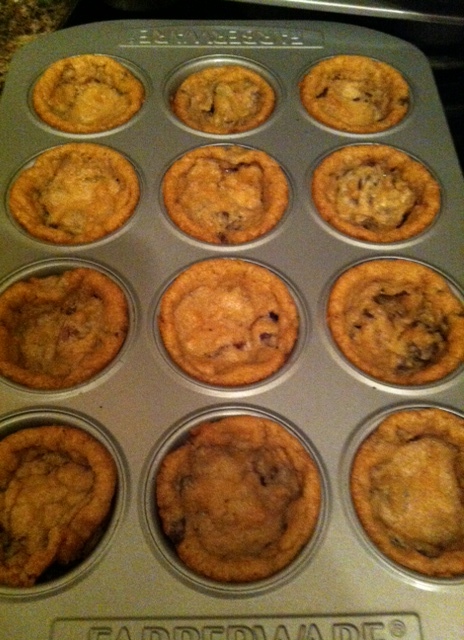 I then placed them in a mini cupcake pan. 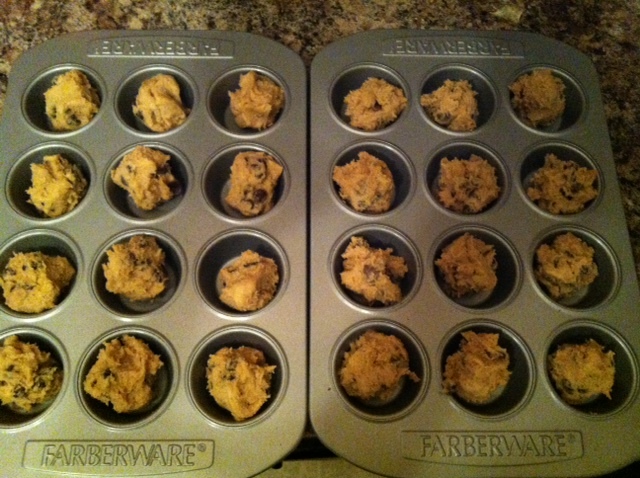 Baked it for the amount of time and temperature on the package of cookie dough and…TA DA!!! These are AMAZING!! 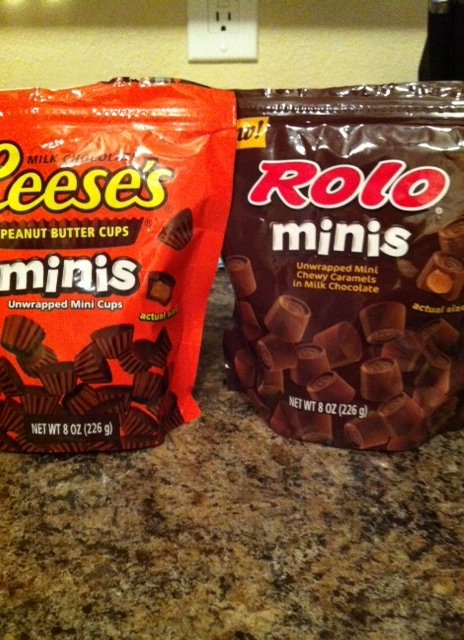 The Rolo’s ooze the caramel out and the Reese’s is a great combination between chocolate and peanut butter. A SUPER EASY, but DELICIOUS recipe for LAZY days! One of the first things things in planning a wedding is picking your wedding colors. My color ideas…sea foam green and white. We were getting married in June and I love the freshness of those colors. My husband, who was really helpful in the overall process but not into details had one request in the planning…burnt orange. Yes, burnt orange for a JUNE wedding. How could I say ‘No’ when it was one of his only requests? So, what did we do? Had a burnt orange wedding! Burnt Orange was appropriate for us, not only because we are die-hard Texas Longhorn fans, but because that’s where we met! I was a Freshman and he was a Junior at The University of Texas when we met. As Texas Exes, we definitely represented. 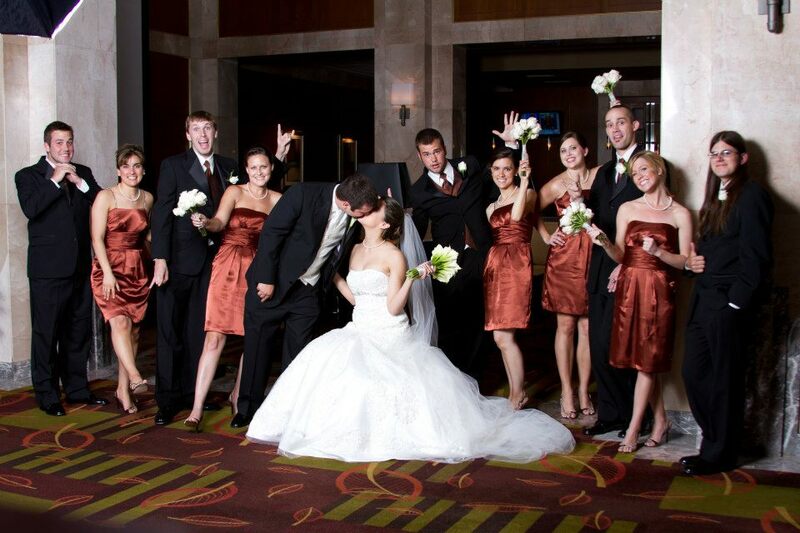 The Wedding Party was of course in burnt orange attire. 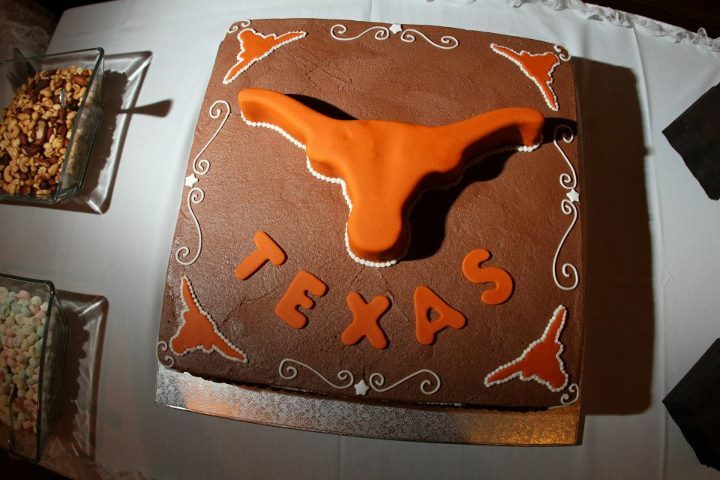 The Groom’s Cake was definitely a longhorn! 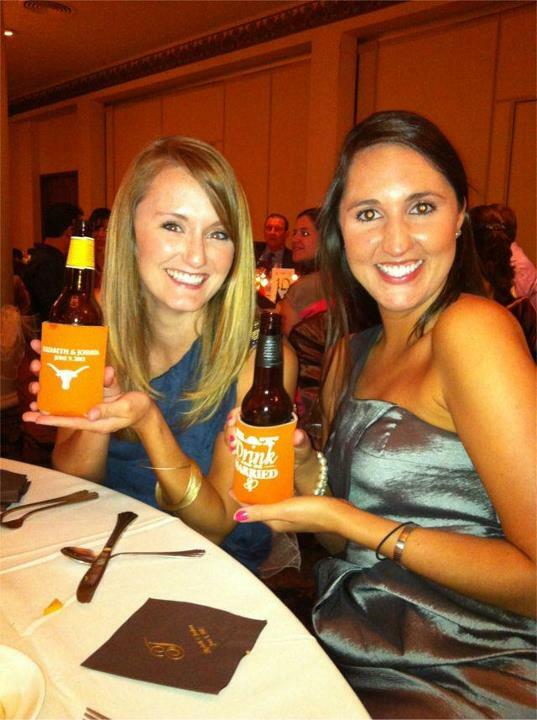 We gave out burnt orange koozies with the drinks. And…of course…we sang The Eyes of Texas and did a good ole Texas Fight! Somewhere in between him asking for Burnt Orange to be one of our wedding colors and the wedding day…it turned into a full blown theme of “Hooked on Each Other”. It was our very own, Texas Longhorn Wedding! We get our wedding pictures today! I am so excited and can’t wait to be able to share pictures from the happiest day of our lives!! Be on the look out for pictures to come in posts later this week. So, we all love using Pinterest to collect our ideas for the wedding? Why not use it to help win money for your wedding?!?! Storymix has teamed up with GigMasters and TheManRegistry to give away a prize package of almost $1200. 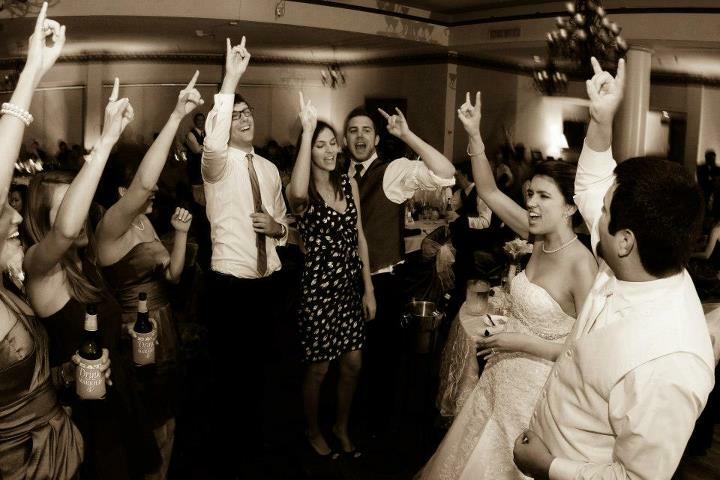 Five Star Wedding Entertainment courtesy of GigMasters.com ($300 credit toward any GigMasters entertainer). A $400 WeddingMix package. Includes use of 3 HD video cameras plus iPhone appto capture behind the scenes guest video clips. Storymix will professionally edit a custom video to be enjoyed on DVD. Don’t miss scenes of the after-party and honeymoon! Total Prize Package is worth approximately $1,200. 4.These pins must include the hashtag #pinandwinwedding so that we can find it and enter you! Tell your friends! For each friend who follows your board, you get an additional entry! The winner will be chosen at random on Friday, July 20th at noon Eastern time, the more entries you have the greater your chance of winning! Have questions? Visit the Storymix blog and leave a comment! It’s official!! We have been married for 1 month!! Wow! Time has definitely flown! 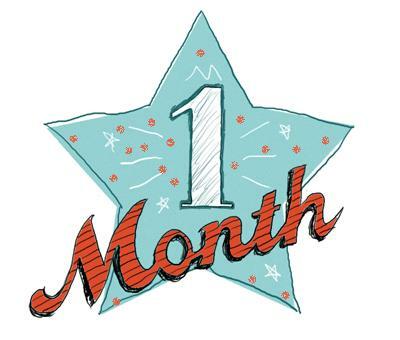 For 2 of those weeks we were away from our normal routine so I’m sure that has added to this whirlwind of a month. So, I had told myself that I would do the Thank You notes within the first month. SO didn’t happen. Well, hopefully I will get them done in The Knot’s recommended 2 months. Yikes! I sure do hope so. I mean, I have only made a SMALL dent in them. Am I the only one that is dragging their feet on Thank You notes? I feel guilty, but I feel like a note the size of a 3 x 5″ just isn’t enough space to really say how thankful I am to them for being a part of our special day. I feel like they are a little corny…but definitely necessary. *Fingers crossed* that I get them done SOON!